Do you find yourself walking around like a zombie before you grab your morning cup of coffee? BuzzCatz Coffee & Sweets has the antidote. The first thing you might notice is the sign of the cat with crazy, swirly eyes. According to Ayla, there’s a story behind this buzzed mascot. The coffee is local and sourced from Fairhope Roasting Company. But BuzzCatz isn’t limited to Alabama beans. Speaking of different, the Buzz Frappes are a local favorite. They’re basically a coffee milkshake with a bit of a kick. Want a little breakfast with your coffee? BuzzCatz has a full scratch kitchen and bakery on the premises. More of a sweets fan? 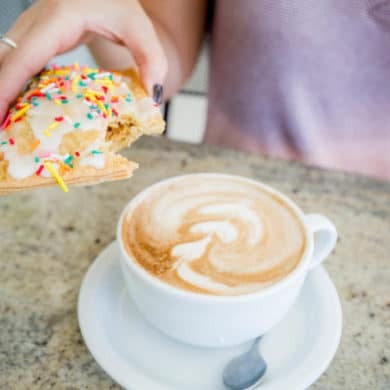 The bakery at BuzzCatz is filled with plenty of treats that would be a perfect companion to your morning cup. One of the favorites on the menu is the BuzzCatz “Pop Tarts.” These delicious tarts are filled with homemade fillings that change often, so you can always try something new! Don’t worry about leaving your furry friends behind, because BuzzCatz has plenty of outdoor seating, and Fido is more than welcome. Being pet-friendly is a big part of the mission. BuzzCatz partners with Orange Beach Animal Care and Control to help stop the spread of stray and feral cats. There’s still so much waiting to be discovered and devoured at BuzzCatz Coffee & Sweets. BuzzCatz Coffee & Sweets is located at 25689 Canal Road Orange Beach, AL. For more information, visit the BuzzCatz website or call (251) 980-2899.